See how chemistry works in everything from soaps to medicines to petroleumWe're all natural born chemists. Every time we cook, clean, take a shower, drive a car, use a solvent (such as nail polish remover), or perform any of the countless everyday activities that involve complex chemical reactions we're doing chemistry! So why do so many of us desperately resist learning chemistry when we're young?Now there's a fun, easy way to learn basic chemistry. 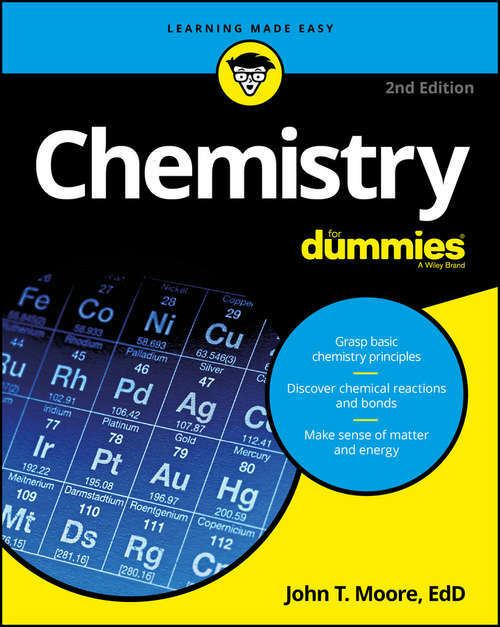 Whether you're studying chemistry in school and you're looking for a little help making sense of what's being taught in class, or you're just into learning new things, Chemistry For Dummies gets you rolling with all the basics of matter and energy, atoms and molecules, acids and bases, and much more!Tracks a typical chemistry course, giving you step-by-step lessons you can easily graspPacked with basic chemistry principles and time-saving tips from chemistry professorsReal-world examples provide everyday context for complicated topicsFull of modern, relevant examples and updated to mirror current teaching methods and classroom protocols, Chemistry For Dummies puts you on the fast-track to mastering the basics of chemistry.